Headquartered in Chantilly, VA, System High has established itself as a preeminent provider of global protection and security technical engineering solutions for critical National Security and Special Access Programs (“SAP”) across the Department of Defense (“DoD”) and Intelligence Community (“IC”). As a pioneer of industry best practices crafted to solve complex, evolving security challenges in support of sensitive programs, the Company’s proprietary methodologies and frameworks preserve advanced technological superiority and unique capabilities across classified, SAP, and Sensitive Compartmented Information programs complete lifecycles. Coupled with non-traditional protection services, cyber and engineering capabilities, custom training solutions, and experienced Subject Matter Experts deeply versed in a range of security disciplines, the Company’s differentiated security offerings have generated entrenched inroads with difficult-to-obtain, high-profile clients, including the Defense Advanced Research Projects Agency, the National Reconnaissance Office, and the Joint Strike Fighter Joint Program Office, among others, presenting major growth avenues into a sizeable, enduring market. As a new investment, Enlightenment expects to leverage the Company’s mission-critical suite of capabilities and extensive long-term relationships to expand its presence within a coveted DoD and IC customer base in support of enduring, critical national security programs. 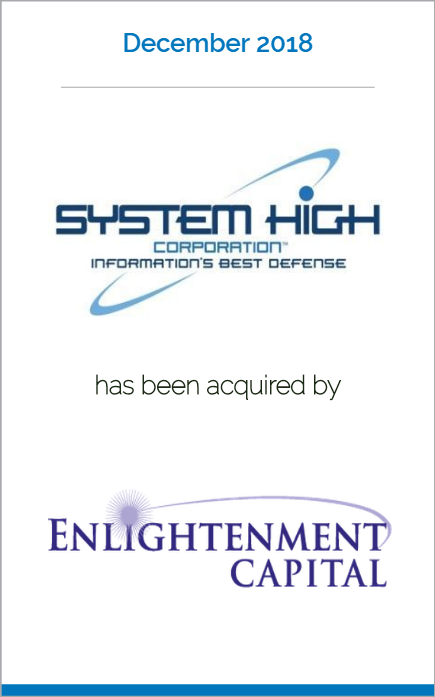 Chevy Chase, Maryland – Enlightenment Capital, an Aerospace, Defense & Government focused investment firm based in the Washington, DC area, announced it has invested in System High Corporation to help accelerate the Company’s growth. System High will serve as Enlightenment’s newest platform. System High is a leading provider of proactive protection (P2), security engineering, counterintelligence, and cybersecurity solutions, serving select government and commercial customers. Enlightenment Capital, a Washington, DC area based private investment firm, provides senior debt, mezzanine debt, and equity to middle market companies in the Aerospace, Defense & Government (ADG) sector. The firm partners with businesses that provide vital services, protect critical infrastructure, innovate cyber and data solutions, enhance decision making capabilities, engineer aerospace systems, safeguard national security, and endeavor to meet the challenges of today and tomorrow. For more information, visit www.enlightenment-cap.com.